So he's spent the past 26 years building and perfecting his proprietary computer system, the Stealth Stocks Trading Indicator (SSTI). Its complex algorithms scour moves on thousands of stocks every single day. Then it signals the plays with the potential for the largest, fastest gains. I won't settle for ordinary. “Average” is for everyone else. Everything is about swinging for the fences and shooting for the moon. I'm NOT satisfied making 20% or 30% a year. I want much more than to simply beat the market. I want to slaughter it. I REFUSE to take unnecessary risks with my money. You can't eliminate risk – not if you want to make any real money. But you can certainly manage the risk… and turn the market's natural volatility into extraordinary gains. Now these kinds of opportunities to make double- and triple-digit profits within just a few days or weeks are by design. And they've led D.R. 's readers to fast gains like 59.64% in seven days, 75.00% in two days, and even 160.29% in just three days. And since the SSTI was expressly created to mathematically manage risk and to maximize the opportunity for profits, there's built-in protection against loss that comes with every recommendation. While Wall Street bankers and brokers guide the masses towards “buy and hold” investment strategies to build their nest eggs, don't believe for a second they follow the same advice themselves. That's why D.R. spent the past 26 years “in the trenches,” building his proprietary computer system, the Stealth Stocks Trading Indicator (SSTI). He's studied and tracked the movements of stocks across years' worth of data. He's tested and proven the results across every type of market condition. And he's perfected SSTI's ability to consistently and reliably signal an automatic alert every time nearly invisible, short-term stock trends are about to turn into fast, extraordinary gains. The SSTI spots high potential profit opportunities week in and week out because it's not just looking for one type of trade. Instead, it tracks thousands of data points across thousands of stocks to spot specific market conditions that have proven to be the perfect set-ups for a highly profitable trade. So there's a pre-selected strategy for every situation. And the payouts come in CASH, straight from the market. There's nothing complex involved – no futures, certificates, or anything like that. So while stocks stayed flat anticipating the Fed's next move, the SSTI spotted that silver had broken a key support level and dropped out of a pattern called a descending triangle. And that's just one of the seven “profit paychecks” readers could have cashed including… 75% in two days… 23.65% in three days… and 59.64% in just seven days. Total these up and anyone who followed D.R. 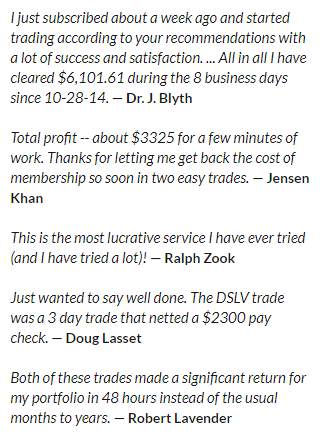 's trades had the chance to cash in for $8,377.94 in as little as 14 days. It all starts with a homerun focus. The SSTI only seeks out the plays with the biggest returns. And D.R. doesn't even consider a stock unless it's set to make four to five times more than average. Since predictable profit-generating moves are all that matters, Stealth Profits Trader offers you unlimited potential. You'll get opportunity after opportunity to rake in extraordinary gains from the most volatile stocks and the most prolific trends, regardless of what sector they're in. And your investments will be naturally diversified because you won't be limited to any niches at all. And while most trading research systems only work with one type of market, Stealth Profits Trader produces extraordinary profit opportunities whether the markets are up, down, or sideways. You'll receive an average of three email alerts every single week no matter which way the market is trending, all designed to put cash gains back in your pocket an average of every 10 days. Emotions never get in the way either. Thanks to the power of the SSTI signals, D.R. gives clear, unbiased Buy and Sell recommendations, so there's never any wondering or worry about when to make a move. All it takes is about one hour a week to read D.R. 's recommendations and follow the explicit instructions in each email alert.